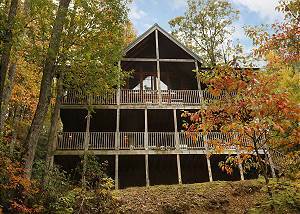 Beautiful 4 bedroom / 3 bath vacation home on popular Ski Mountain near Ober Gatlinburg. Come enjoy the hot tub, pool table, and foosball, after... VIEW NOW. 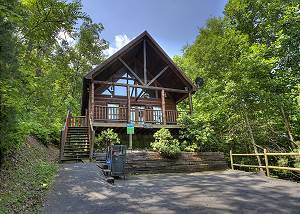 Looking for a pet-friendly cabin in Gatlinburg? Check out our cabins especially for families and man's best friend. Stay in our Gatlinburg and Pigeon Forge cabins with game rooms to add a little excitement to your Smoky Mountain getaway. Rent one of our Gatlinburg cabins with theater rooms for a high definition movie experience with family and friends. Check out our Smoky Mountain cabins with indoor and outdoor swimming pool access. 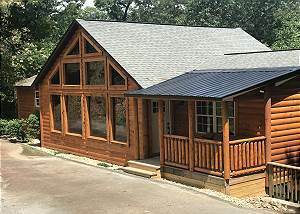 Acorn Cabin Rentals is the recognized leader in luxury rental cabins in Gatlinburg, Pigeon Forge, & the Smoky Mountains, offering the finest of furnishings for the romantic getaway and family fun. Whether you are looking for a cabin with a spectacular mountain view or a cabin on the Little Pigeon River, Acorn Cabin Rentals offers affordable deluxe cabins & economy chalets to suit your family’s needs and vacation budget. Our Gatlinburg cabins offer the finest of furnishings conveniently located near Dollywood, Gatlinburg, Pigeon Forge, Ripley’s Aquarium, shopping, fishing, white water rafting, golf, and the great hiking and waterfalls of the Great Smoky Mountains National Park. These great cabins are perfect for a romantic getaway, honeymoon, family vacation, reunions, or a corporate retreat! With exquisite mountain views and locations just minutes from the National Park, Acorn’s Gatlinburg Cabins allows you to take in a true mountain experience. Sit on your deck and gaze out at blue, misty mountains or immerse yourself in wilderness hiking, rafting, horseback riding or skiing. It’s all here for you! For a getaway that feels secluded but is still near great restaurants, entertainment and outdoor activities, look no further than Acorn Cabins. Our goal is to make your trip as special and comfortable as possible with warm hospitality and amazing amenities like Jacuzzis, fireplaces and more. Convenient to everything, from hiking, fishing and white water rafting in the National Park to the more than 50 family attractions, 200 stores and 140 specialty craft shops, Acorn’s Smoky Mountain Cabins brings you the ultimate in selection and quality for every vacationer wishing to discover the magic of the Smokies. 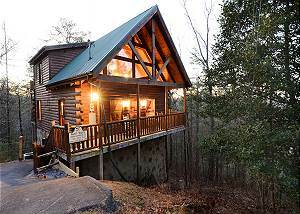 Luxury Smoky Mountain cabins in premier locations can be yours with Acorn Cabin Rentals. Just as you won’t find a place with more year-round fun than Gatlinburg, Pigeon Forge and the Smoky Mountains, you also won’t find better lodging and hospitality in the area than with Acorn Cabin Rentals. Featuring everything from economy cabins with every comfort to lavish rentals with private indoor pools, Jacuzzis and even rock climbing walls, some cabins boast spectacular mountain views, the finest furnishings and access to a plethora of attractions like the National Park, Dollywood and Ripley’s Aquarium. From cozy couples’ retreats to large family reunions, Acorn Cabins in Pigeon Forge has something for everyone!